While this set is clearly focused on the gun it does contain a number of figures, and so is of particular interest to us. 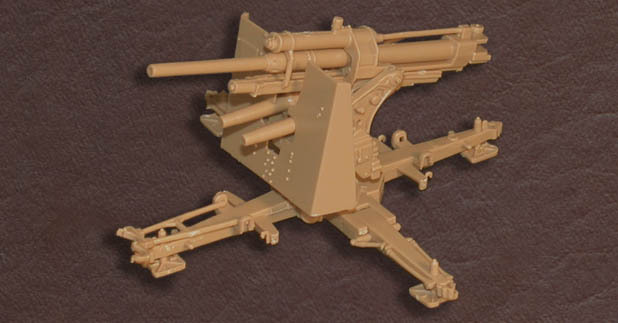 As usual we will pay little attention to the main piece, the gun, although this 17 piece model is really nice to put together and has been made to allow it to traverse through 360 degrees and have an elevation from -3 to +85 degrees (i.e. the relevant parts are not glued), just as with the real thing. However as this has a shield it is clearly intended for an anti-armour role rather than the original anti-aircraft role, and it is as a tank-buster that it acquired such an awesome reputation, particularly in North Africa. 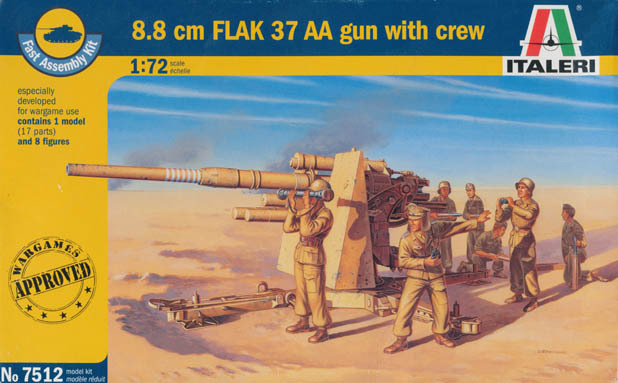 Suggestions that the 37 was not used for this role have apparently been refuted, so this makes a great artillery piece that to our casual eye looks accurate and nicely detailed too. Moving on to the crew, the first thing to say is these men belong to a Luftwaffe battery. This is apparent because all wear the Luftwaffe tropical trousers (with the large pocket on the left thigh), and the officer is wearing a 'Hermann Meyer' cap (introduced April 1942), which again was a unique Luftwaffe item. This cap (the name was unofficial and a reference to the stupidity of Hermann Göring) has not been done before in this hobby, and so is particularly welcome. Otherwise the men are in fairly standard costume, with some in tunics and others in shirt sleeves. Some wear helmets, some side caps and some the popular peaked field cap. All this has been well sculpted apart from the side cap, which is shown pulled down hard over the head when it was almost always worn at a jaunty angle over the right eye. More could have been done to make these men more 'casual', but what we have here is absolutely fine and we can have no complaints. The poses rather speak for themselves. We have four men handling ammunition, plus a gunner, range-finder and two officers or spotters. All these are OK as far as they go but as so often what is lacking is anyone actually handling the gun itself. The seated man sits on a stool on the gun, but he has both arms firmly at his side and is therefore doing nothing. Plenty of photographs exist showing the gun being used, so we are not clear why no attempt has been made to have men actually using the gun - at least reading the instruments or something. Exactly what the first kneeling man is doing is also far from clear. Presumably he is picking up a round from the ground, but he is not one of our favourite poses. All the figures are crisply sculpted and crisply moulded, and while some of those handling ammunition have a little excess plastic, no one has any flash and these are very good quality figures. The man with the range-finder has his instrument as a separate piece, which is well worth the small effort necessary to assemble. At an average 24.5mm the height of the men is good, so with the very good detail these are excellent. Artillery crews, like vehicle drivers, are not nearly as common as they should be in this hobby, and we loudly welcome any company that provides a crew with their kits. Italeri have produced a very nice crew, although why they chose the less widely usable Luftwaffe instead of more generic figures we cannot guess. The quality of production is excellent, but the poses range from great to rather pointless. Still a gun crew is a gun crew, and with few rivals this kit has some very useful figures, most of which we would happily recommend.